After a second try at our top bar bee hive, another failure. Yes, I am disappointed and saddened by this outcome. The hive truly seemed to be doing very well during the peak garden season…July. Lots of activity. Our top bar has 3 openings. At the time, only one opening was unobstructed. I decided to “help the bees out” by allowing access to another opening. I think that this decision was my biggest mistake. My second big mistake was that I had stopped feeding them. Understand, I am new at all of this business. With the bees, I don’t want to be always in their business (i.e. constantly entering their hive). Perhaps not the wisest plan. So…what happened? Well, the hive got quiet. Bees were still going in and out, but the numbers seemed much less than usual. Eventually, no activity was going on. Did they swarm? One of the combs had what looked to be a queen cell/swarm cell…I need to read more on the difference. 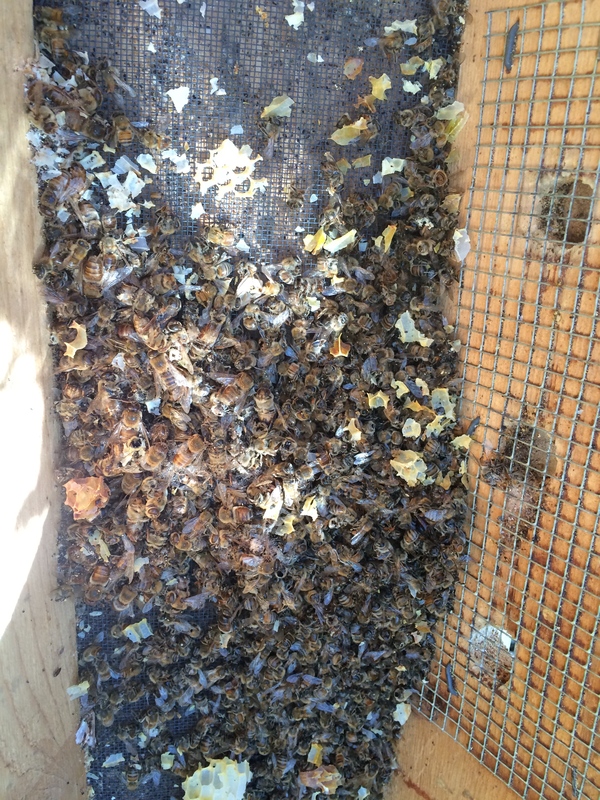 Bodies were also present outside the hive (hard to see because I had mulched with straw around the hive). My suspicion is that when I opened the other access hole into the hive, my new, weaker hive was unable to defend both openings fully. My neighbor has two established hives just down the hill from us. I bet his bees found my hive and helped themselves. Thinking I was helping my hive, I think I caused its demise simply by removing a cork. 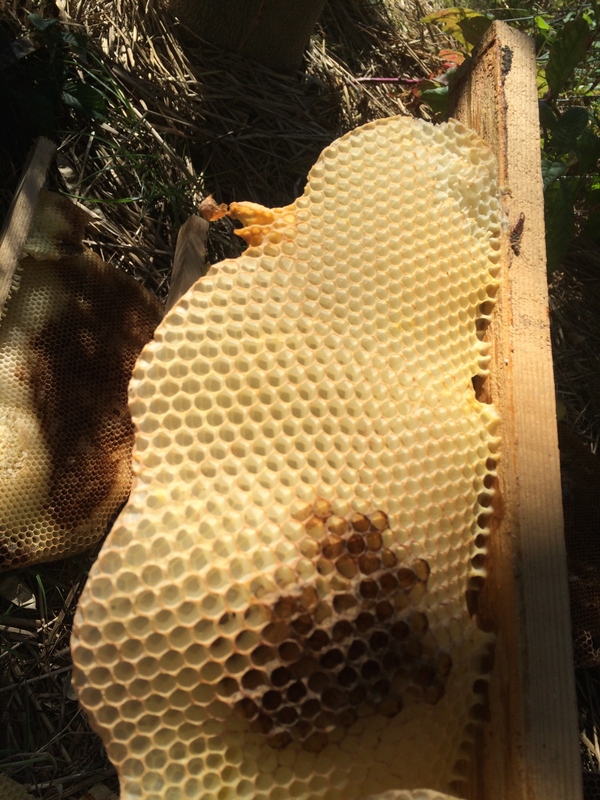 See that funny looking “growth” on the comb…top of the photo, sorta orange in color? Queen cell? Swarm cell? I don’t know. Did the swarm? Were they robbed? It is a sad day when you see a demise in this wonderfully active and important little creature the “Bee”. They are fun to watch as they go from flower to flower,doing what they do best as well as creating hives that produce “Honey” as well. Bee’s are “Awesome”. Yes, this sounds like robbing, from what I’ve read. You creating a second opening might not have helped, but I’m not sure this would cause the problem. Most likely the hive had a weakness to begin with, perhaps mites or some other disease. I think you started with commercial package bees, correct? If so, they may not be acclimated to your area and would thus more likely need treatment to survive. Aside from numerous books and other local beekeepers, you might also look at beesource.com. They have been discussing problems like this lately, which you might find interesting. Good luck! Wow! Many thanks for the info and the link. It was a commercial package – from Georgia I believe. I’m in Virginia. A big weakness is their keeper! Lots to learn. No problem. You probably know there is a beekeeping association near you: http://nrvba.org/ I’m in Virginia as well, in Prince William County. Hoping to start keeping bees this spring. I have a top bar hive already, and will probably try a Langstroth hive as well since that is what most people around here seem to do.